Tucked around the side of the Arts Annex, eight satellite dishes loom over the landscape. 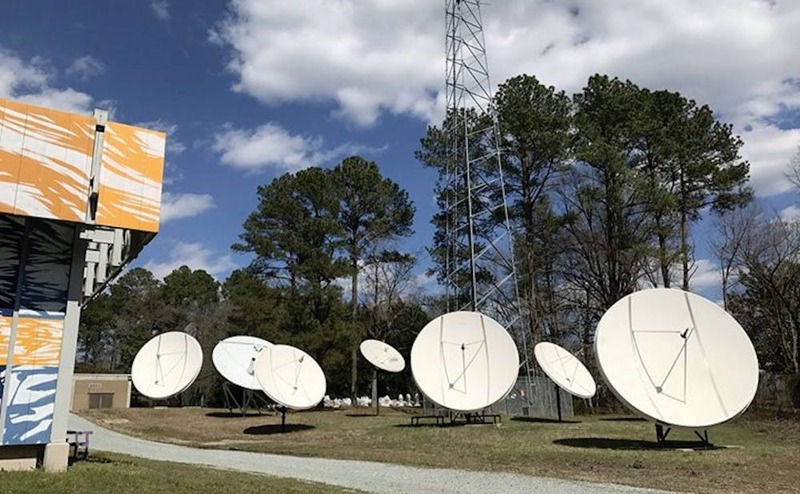 These dishes have been there since 1991, when Duke Tel Com installed them to receive and broadcast educational programming. Durham, NC – Friday February 16th. In celebration of their 7 year anniversary, HappymessART will become ARTPOST. The event will feature artwork by Durham artist George Mitchell. Baritone sax player and Third Friday Durham busker Brannon Bollinger, of Boom Unit Brass Band will join the festivities. A GoFundMe campaign will be unveiled to raise money for Mitchell to recognize his dream of finishing a series of works which he started in the late 1990’s, inspired by black Olympic athletes. George was a victim of gun violence by a family member and now is a paraplegic. After receiving a BA in Art from North Carolina Central University, Mitchell went on to become the first African-American to receive an MFA from the University of North Carolina at Chapel Hill. George lives with many health challenges and barriers but his love of art and his passion to continue creating has been inspiring to all who encounter him. Thanks to ARTPOST’s ARTreach programming, George Mitchell and Holly B. Phelan Johnson, owner of ARTPOST, have been working together for over 4 years in an effort to assist and encourage Mitchell to achieve his goal. Funds raised will be used to employ local artists to serve as apprentices to help Mitchell complete his series. Since opening in 2011, HappymessART Studios, Classes and Supplies has been dedicated to serving both existing and emerging artists and their art-making. To continue to honor their commitment, vision, and to more accurately reflect the community-oriented nature of the business, HappymessART proudly announces the launch of ARTPOST. Their new logo features a symbol inspired by one of Mitchell’s first pieces in his series, entitled “Freedom”, a stylized sculpture of the Olympic torch. While the brand name is changing to ARTPOST, the business will continue to provide the same high quality art classes, events, art-based community service opportunities, and to sell unique, high-quality art supplies in their shop. This exhibit at The Carrack Gallery, will run from February 16th-February 25th. ARTPOST will host a variety of interactive and community engaging activities during the exhibit. For more information visit The Carrack Facebook Event Page.